Russian President Vladimir Putin has said that US and EU sanctions will harm not just Russia but the global economy. He said the sanctions were a mistake, going against trade accords and only the UN had the right to impose them. The sanctions were introduced over Russia's annexation of Ukraine's region of Crimea and its alleged involvement in eastern Ukraine. 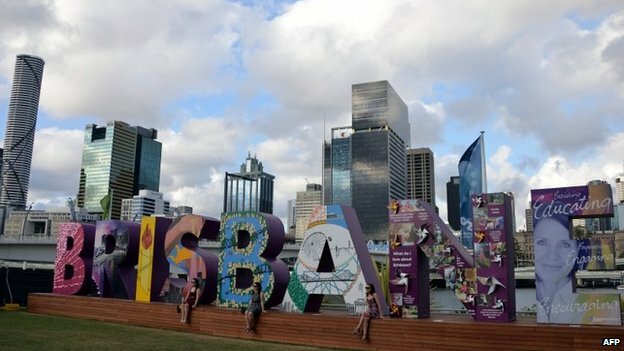 Mr Putin was speaking ahead of the G20 summit in Brisbane, Australia, which is to focus mainly on promoting growth. 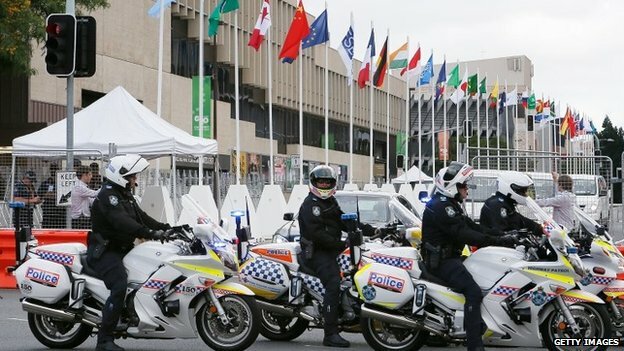 World leaders including Mr Putin, US President Barack Obama and Chinese President Xi Jinping are gathering for the two-day meeting. Australian Prime Minister Tony Abbott said leaders would discuss job creation, identifying tax cheats and strengthening the global economy. Campaigners also want climate change on the agenda, but Australia has been firm in keeping it off. In an interview for Russia's Itar-Tass news agency, Mr Putin said it would be pointless to raise the issue of sanctions at the summit but that he would talk about it if asked. The sanctions were illegal and harming not only Russia but world trade, he added. This contradicts international law, because sanctions can only be imposed within the framework of the United Nations and its Security Council, he said. Mr Putin added that the sanctions also went against the principles of the World Trade Organization (WTO), which the US had helped set up and was now grossly in breach of. This is harmful, and of course is doing us some damage, but it's harmful for them as well because, in essence, it's undermining the entire system of international economic relations, he continued. He said Russia “ as an oil and gas producer with gold and currency reserves “ could cope with the sanctions and would continue to meet its social commitments. Mr Putin also warned Germany that 300,000 jobs could be at risk if there were no contracts with Russia. Russia's Interfax news agency quoted his spokesman, Dmitry Peskov, as saying the Russian president would meet German Chancellor Angela Merkel separately on the sidelines of the summit. The BBC's Steve Rosenberg in Moscow says the sanctions have been putting increasing pressure on the Russian economy and on the national currency, as the rouble continues to weaken. The sanctions have been imposed in several rounds, beginning in March after Crimea's annexation, and include travel bans and asset freezes on certain individuals and businesses. More were imposed following allegations that Russia was sending its soldiers to fight with separatist rebels in eastern Ukraine. The Kremlin denies the allegations. More than 4,000 people have died in the conflict between Ukraine's military and pro-Russian rebels in the eastern Donetsk and Luhansk regions. 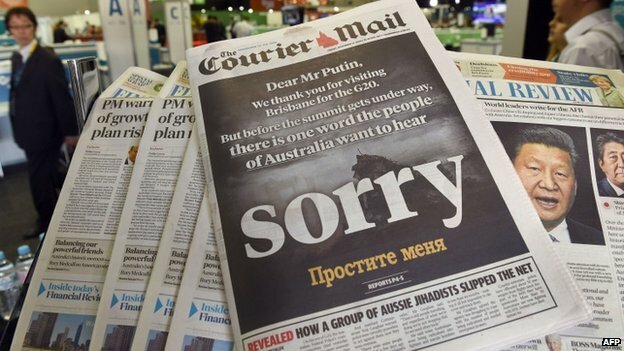 Mr Putin has also come under fire because of the alleged role of pro-Russian rebels in the downing of Malaysia Airlines flight MH17, with many Australians calling for him to be barred from the summit. Thirty-eight Australians were among the 298 people who died when the plane was brought down over rebel-held eastern Ukraine, by a missile that the West believes was supplied by Russia. Russia rejects the claim. When the summit begins on Saturday, leaders are expected to expand on plans agreed in February at the G20 finance ministers' meeting to boost global economic growth by 2% in five years. Tax avoidance by major multinationals will also be discussed, with Australian Treasurer Joe Hockey promising very aggressive approaches. However, Australia is facing criticism after failing to allow climate change on to the agenda and over its domestic policies on the issue. 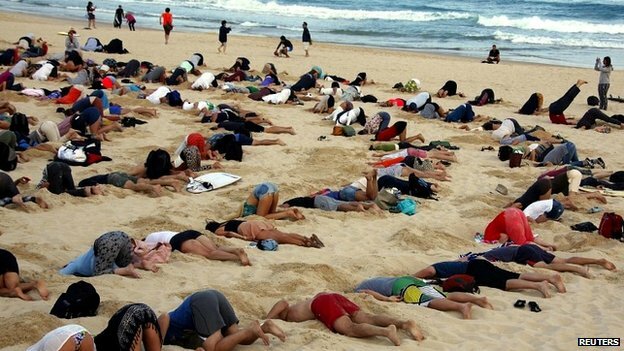 On Thursday, more than 200 protesters buried their heads in the sand at Bondi Beach in a symbolic demonstration over climate change inaction.